The MOD102+ expands on the same all analog vacuum tube classic American circuit design combined with a British style Class A output section as the Original MOD102 with some much added special “+” features. These special features include a three position progressive toggle switch for off-standby-power and additional push-pull functionality for each control - pull out the bass control knob for “mid boost”, pull out the treble control knob for “bright”, pull out the volume control knob for “turbo”. These new features and a JJ ECC803-S (a long plate 12AX7 known for its complex mid range tones) allow for a wider variety of tones and extra control for the user. Hammond Mfg 269EX power transformer and P-T31 single ended output transformer. Cathode biased class A power tube operation (no bias adjustment needed). Assembled Kit Weight: 5.55 lbs. Packaging Dimensions 13 in. x 11 in. x 9 in. Nice little kit! Instructions are pretty clear and it's certainly not overly complicated to build. Having some amp repair/building experience helps, but I'd say even a beginner could buy this, build it, and be playing it within a day or so. Once built it sounded pretty good as well. Fun to swap tubes around, substituting the 12AX for a 12AT, AY, or others. The 'effect' changes on the pull switches are pretty subtle, so don't expect anything dramatic there. But, the amp makes a great platform for learning, and even 'expanding' from the original design. I've put an EIA connector in the back of mine so I don't have a cord sticking out. I put some tall 'feet' on it so it would clear a speaker box handle. And, the power transformer is suitable for adding a 6CA4 rectifier, which I plan to do in the future. I'll have to move the filter capacitor section around some to make clearance for the socket, but it's a 6 volt 9-pin rectifier, so will work perfectly in this amp. I might even 'upgrade' the output transformer....or play with some yellow jacket type adapters to try a different output tube. In all, a lot of fun to build, sounds great for what it is, and I'm very glad I made the purchase!! A 'GREAT' value!!! Asked by Anonymous on February 13th, 2016. You could adapt this for hi fi, but you would need to drop the gain in the preamp stage(s), by using several methods, and change some other components for better frequency response. True global NFB, and changing the slope of the gain stage would help, but then you will also need separate phono preamp(s), and another channel for MP3s, digital, or CD inputs, etc. It was designed as a guitar amp. I thought Antique Electronics did make a little hi fi amp kit, at one time. They also used to sell Dynaco parts & modification kits too. I think they still make one that eliminates the need for 7199 tubes. It could be used as an audio amplifier but you would not get a lot of clean headroom before it breaks up. It's design is definitely for guitar. Asked by Anonymous on September 12th, 2015. The Mod 102+ kit is listed as having a difficulty level suited for the experienced builder.There are detailed instructions included but if you desire a more beginner focused project, visit modkitsdiy.com to see our assortment of kits designed for all levels of experience. Asked by Anonymous on November 20th, 2015. The MOD 102+ kit comes standard with a 115/125 vac power transformer and can not be customized. However, the European transformer can be purchased separately and the kit can be modified to suit your needs. Asked by Anonymous on November 28th, 2015. Our SKU P-H1451-16 should be a compatible fit. Asked by Anonymous on February 12th, 2016. 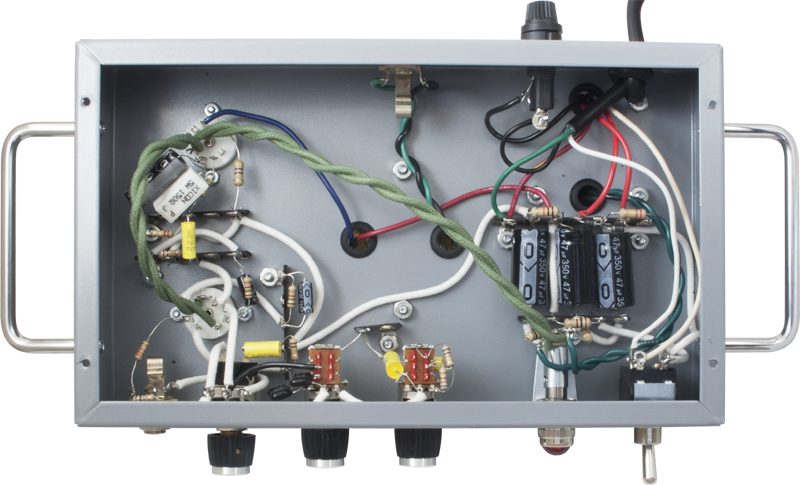 This amp puts out a max 8 watts output with an 8 ohm load. I'd probably suggest either a Jensen C8R or C10R if you prefer a 10" speaker. A 12" speaker such as a C12R can be used as well. You can visit Jensentone.com to check out sound samples. Asked by Anonymous on February 24th, 2016. The chassis is 10" in length without the handles. Asked by Anonymous on March 1st, 2016. For any post build technical questions please email info@modkitsdiy.com . They will be glad to help you out. Asked by Anonymous on November 11th, 2016. Since this is an 8w amp at 8ohms, an 8ohm P10R should work just fine and sound fantastic. In regards to speaker wattage, you can go up in wattage but you do not want to go down. An 80-90W speaker will work as long as the ohms match. Since this is an 8 watt amp, it is not going to, "push" you speaker to its full potential and break it up. Some people like speaker breakup and some people don't. Asked by Anonymous on February 24th, 2017. It attached to the top of the chassis flush. That way there is no obstruction to the controls. Asked by Anonymous on July 19th, 2017. Yes, some people have mounted this as a combo. Asked by Anonymous on August 30th, 2017. Yes, do a search for K-MOD102-F. This is our foreign version of this kit. Asked by Anonymous on December 1st, 2017. You can try either the P-T125CSE or P-T125DSE. The footprint will be different as these are larger transformers and you will have to drill at least one extra hole. This would be possible and at the discretion of the builder. We would not be able to offer and support on how to achieve this mod. Asked by Anonymous on March 9th, 2018. Not without modification and that would be at the discretion of the builder. We do offer a reverb tank kit called The Wave. Do a search for: K-MOD103. Asked by Anonymous on September 25th, 2018. Asked by Anonymous on February 1st, 2019. Yes, it is safe to use a 16 Ohm speaker with this amp. Asked by Anonymous on April 8th, 2019.